Moreover, this feeling is heightened even more when the espresso machine is a super-automatic espresso machine. These machines are considered the elite of the espresso machine industry due to their numerous automated features and benefits. While these machines can cost thousands, due to the extensive features, there are also many super automatic espresso machines under $1000. Super Automatic Espresso Machines: What are they? What is meant by “super automatic”? What can you make with a super automatic espresso machine? Have you ever wondered if there was a machine that can virtually almost do anything? Well, for the espresso industry, it would be a super automatic machine. These machines are built for your convenience. In order to minimize your efforts, these machines are designed to grind, tamp, brew, extract, steam and froth every single espresso shot. Now, this is simply just the beginning of the list of features of these machines. Without question, these machines are known to produce the most consistent shots of espresso with the highest level of preference and customizability. Have you ever dreamt of brewing a cup of espresso at the touch of your fingertips? Have you ever dreamt of brewing a cup of espresso from your cell-phone? Don’t doubt Super Automatic Espresso Machines – they are your virtual coffee and espresso-making friend. Naturally, this does make super automatic espresso machines the machine of preference for all espresso lovers who value convenience and ease of use over everything else. However, it should be noted that these machines are as their name suggests: fully automatic. This means there is usually very little control for the end user over fine tuning variables. Most of the variables such as temperature, grind, and brewing time are already pre-configured. Some machines do indeed have dials that you can use to adjust the size of the shot and the intensity, but that’s about the entire extent of control that you have. 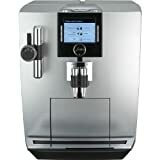 Semi-automatic and manual machines will have their fan-bases; however, many often wish to reach the status of a super automatic espresso machine. The biggest factor in super automatic espresso machines is convenience. On my go-to semi-automatic machine, it takes me about 5 to 7 minutes from tamping the coffee to steaming the milk and finally having a ready beverage in hand. During this time, I have to be present near the machine since I’m involved in every step. On the contrary, I could just push a button on a super automatic espresso machine and then forget about it, only to come back in a few minutes to have a ready cup of coffee. One superb advantage of these machines over others is the built in grinder. Coffee grounds are freshest the sooner they are used after grounding, so ideally, you want to grind right before brewing. However, that’s not always possible and you usually end up grinding and storing the coffee to consume over a week or so. In super automatic espresso machines, you just drop in coffee beans and the machine will only grind as many beans as it needs to for the shots it’s brewing. Due to all of the features and automated abilities, these machines do tend to reach thousands of dollars. Though, as mentioned before, there are a bunch of super automatic espresso machines under $1000. Let’s take a look at the top-rated Super Automatic Espresso Machines available on the market right now. When you want to buy a high quality super automatic espresso machine under $1000, you need to look at Italy. Reigning as one of the Kings of the industry, DeLonghi produced one of the finest machinery in the entire industry with the ESAM 3300 Magnifica. This beast is pristine and an aesthetic masterpiece. This can stand with the greatest on the top-rated list and produce some of the best cups of espresso of all of the machines. Without further ado, let’s look at these features. Every user wants a machine that is customizable. This machine comes with a high-quality front control panel that gives the user power of their espresso desires. Whether you want your shots stronger or weaker, the choice is yours on the control panel. With a bean-to-brew system, there is no effort or delay in time on your behalf when brewing your cup of coffee or espresso. This machine will do all of the work for you at the coarseness of your preference. With a quiet burr grinder, your shots will be a full-bodied shot. With stainless-steel boilers, each shot will always be accurately heated. You will never need to worry about missing an extraction or pulling a shot because this machine comes with an instant-reheat function. Your espresso shots will be perfect all the time. If you did not know, every DeLonhi machine comes with the infamous “Cappuccino System.” This is perfect to create the DeLonghi steamed milk or froth that many espresso makers spend hundreds, if not thousands, for. If you have not heard of a Gaggia machine before – you should know a secret: this brand is stellar and five-star worthy. Known for their impressive espresso machines and amazing frothing systems, Gaggia has nagged two spots on the Top-Rated list. With an impressive line-up of features and a beautiful exterior, this piece of machinery is perfect for any kitchen. Let’s take a peek into the features of this top-rated espresso machine under $1000. All espresso-lovers prefer a machine that has customizability options. With the Gaggia Anima Deluxe, the user has full control over different brewing options. Whether you are seeking an espresso or lungo – your shots will always be perfect. With a built-in auto-frothing feature, all of your milk-based drinks will be made with the richest and creamiest froth you can imagine. With many other super automatic espresso machines, the hopper and water tank are often hard to access and can become a hassle. With a removable 60 ounce water tank and easy accessible hopper, this machine is extremely easy-to-use and function with. One bonus feature is temperature control. The user will have full control over the temperature of the espresso shot. Many machines often only allow for one temperature. When it comes to Super Automatic Espresso Machines under $1000, this is nearly a steal for all espresso lovers. 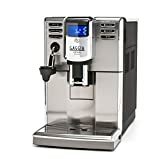 With the benefits and features of more expensive machines, the Gaggia Brera Super Automatic Espresso Machine is cheaper than you are probably thinking. Not only this, but it also a brand name, Gaggia. Gaggia is famous in the espresso industry and a trustworthy company to invest your money with. Let’s take a look at some of the features of this machine. This machine comes equipped with a Pannarello wand, which is one of the best frothing and steaming wands in the industry. Not only this, but it can also be used to generate hot water for tea and americanos. This machine was built for convenience and ease of use. Any user who has bought this machine can claim how easy the machine was to access and learn. With a user-friendly display with push button controls and an LED display, this is a treat for any espresso lover. One of the purposes of a super automatic espresso machine is to cut-down the time waiting for machines to brew or war up. With rapid steam technology, the Gaggia Brera is built for quick heat up times and brewing. It’s hard to say that there is a better espresso machine than the Jura Giga 5 Automatic Coffee Center. The truth is, there is not. This espresso machine is pure bliss for the espresso lover. If you love espresso, this machine is for you. Purchasing this machine gives you an option between Piano Black and Aluminum. Many machines often don’t provide a variety in looks but Jura understands that everyone prefers different looks. This is easily the FASTEST machine in the industry. With two ceramic disc grinders, this machine will not only quickly create the perfect cup of espresso, it will also do so quieter than a mouse. With a TFT display system, you can create a LIST of all different specialty coffees that you probably have dreamt to make at home. In fact, there are over 17 different specialties options! Can you imagine the variety on one single machine? How powerful is that! Due to the two grinders that the machine has alongside two heating system, the machine literally will prepare the grounds and the espresso to near perfection. If perfection did not exist yet – this machine just redefined the closest thing to it. You never have to fear your machine getting too hot. The machine was built with an automatic system to remove the heat through adjustable Venti Ports. You can consider this the machine’s personal ventilation system. The Jura is meant to make every owner a true an authentic barista. Built with over 12 specialty recipes in the Rotary Switch, you can learn through pictures and text how to make the perfect cup of espresso. The last feature you can’t forget about is the absolute beautiful design of this machine. It is probably one of most beautiful pieces of machinery that can ever hug a countertop. That is, until you graduate to the next level of Jura, the Jura Giga X7 Professional. There is a reason why there are multiple DeLonghi’s on this list – and this machine is going to make it a whole lot better. The Prima Donna Fully Automatic Espresso Machine is a blessing to look at and use. With Latte Crema System, a sleek and beautiful design, and a massive 2 Liter Water tank, this is the crème de la crème of DeLonghi. For more, let’s look at their impressive list of features. 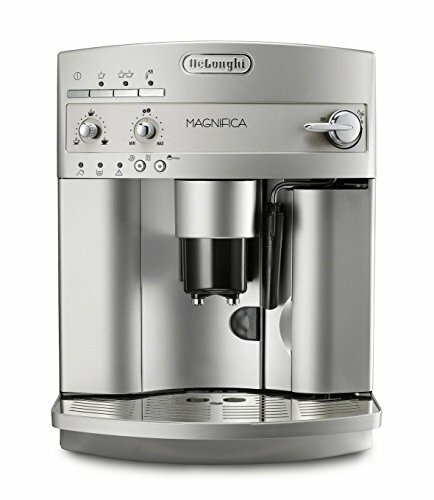 The machine comes built with the DeLonghi patented Single Touch Latte Creama system. This is the feature that is responsible for producing the absolute perfect shot or cup of cappuccino. Built into this feature is an automatic cleaning function. This is meant to do more work than the actual user during the cleaning process of the machine. What is better than a single-shot brewing cycle? How about a twin-shot brew system? This machine will allow the user to create two different perfect creama shots of espresso at the same time. One of the biggest selling features of this machine is the beautiful touch control panel. With over 18 languages, this institutive feature is just awaiting your first direction. Don’t wait any longer! Could you ever go wrong with a Jura espresso machine? I think not. Jura is sort-of in its own tier in the game. 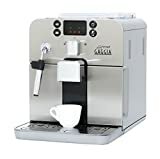 You truly can not compare the Jura Impressa J9 One Touch with the DeLonghi ECAM28465 – this machine comes with some of the finest features and designs to match its hefty price tag. Known as one of the greatest and top-rated machines, let’s take a look at what makes this machine so special. What makes this machine so special is its beautiful TFT display with Rotary Selection. The whole idea behind this is intuitive operation. In fact, once the machine learns your drink of choice, all you will need to do is press the button once and the magic machine does the rest. With an adjustable spout, you will be able to decide the size of your drink that you are going to have. This is a nice feature that many super automatic machines do not often talk about or market. Jura has developed one of the best foam and steamed processes in the industry. With fine foam technology – this machine provides you with genuine and authentic foam that will make you wanting more. As you may know, grinders are one of the most important facets of a delicious shot of espresso. With an impressive six-level, conical grinder – every single granular of coffee is going to be ground into your desired level of fineness. If you are to purchase this machine, you will also get the luxury of a stainless-steel vacuum milk container. The DeLonghi ESAM 3300 is our favorite from all of the machines we have reviewed here. 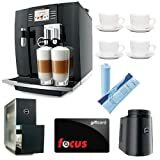 Not only is it the highest rated on Amazon, it also brews the most consistent coffee, and is the most budget friendly machine out of the lot. Even though there are many literal bells and whistles on the machine, it’s very easy to use. Two knobs adjust the amount of coffee dispensed and grind(strength, since finer grind means more strength), and with the touch of a button, the machine will grind coffee, heat up water, and brew you some espresso. These machines have the word “super” in them, so it goes to follow that there shouldn’t be much these machine’s can’t do, right? The classic Italian coffee with espresso and steamed milk, this is one of my favorite coffee preparations and the whole reason I myself bought an espresso machine to start with. Super automatic espresso makers have steam wands built in, so they’ll make some really nice foamy milk to top on to your espresso shot. Macchiatos are similar to espresso shots except they have a small added layer of milk foam on top – not as much as a cappuccino, though. Most super automatic machines have a macchiato setting built into them, but even if they don’t, you can simply top off your espresso shot with a bit of steamed milk and you’re good to go. Steaming milk with these machines is really easy and can be done with the push of a button or turning a dial. Italian for “long”, Lungo shots are espresso shots with an added amount of espresso water, increasing the quantity of the beverage without compromising on flavor. Ristrettos are the opposite of Lungos. Lungos have more volume, while ristrettos are even less in quantity and result in an even stronger shot of coffee. Be prepared! If you enjoy the rich taste of espresso but you don’t want to add milk, and feel that an espresso shot is too strong, you can dilute it with some hot water to make a classic Americano. When it comes to semi automatic vs super automatic espresso machines, there are just a few factors that you need to consider. Generally speaking, super automatic espresso machines have a lot more parts in them and as a result there are more things to clean and make sure they are working correctly. There’s also a likelihood of more things going wrong: for example, a single machine will have a grinder, water tank, heater, pump, steam wand, and all the computerized components that control the brew. Semi automatic machines will just have a water tank, heater, pump, and steam wand – and the computerization is very minimal, so you’ll have to do most of the steps manually. There are less things to clean in a semi automatic machine than a super automatic machine, and less things that can potentially go awry. Of course, most manufacturers do offer warranties. If you wish to retain as much control as possible over your espresso shot, then you may wish to consider getting a semi automatic machine since it allows you to control the tamp, the amount of water, and the length of the shot. If you’d rather just have a great beverage every single time and don’t want to concern yourself with the details, a super automatic machine will make excellent coffee. Generally speaking, super automatic espresso machines will make barista-standard coffee, even if the person operating the machine is a complete newcomer to coffee.